It’s been storming all day today, so I thought alittle simple Thank You card would be nice. 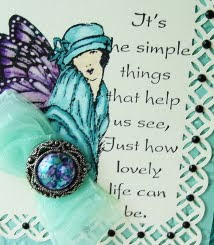 The image is from TAC and it’s called “Fly” and “It’s The Simple Things”, is from The Stamp Barn. Copic Markers in the following colors were used; BG72, BG75, V09, V06, E00 and O plus a Gel Pen. Plus Martha Stewart Modern Garland punch. Thanks for stopping, stay cool and dry today. so beautiful Vada! Exquisite coloring on that stunning image! Love it! Hope your storms subside for the weekend! This is gorgeous! 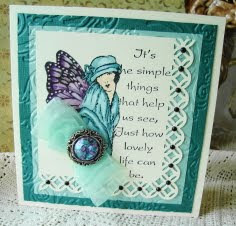 Love these beautiful colors, and those little rhinestones along the punched edge. Beautiful colors on a beautiful card! Love that image!